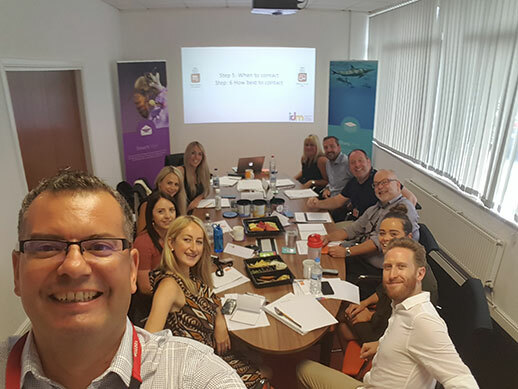 Earlier this month, the entire customer service team spent a day on site but away from their desks participating in a day long Customer Retention course provided by the Institute of Direct Marketing (the IDM). At RNB Group we pride ourselves on our excellent customer service and we never underestimate the importance of this. We believe that if our customers are happy with the service that they are receiving then they will have no need to look elsewhere. However, we also know that you’re never too old to learn something new and we felt that a fresh perspective on how we handle and speak to our customers could be useful. With the help of the IDM we came up with a bespoke course that suited our aims and goals, specific to our customer base and levels of experience. On a rainy Monday we had a fun and informative day in the boardroom learning some new (and very secret) techniques which was unanimously declared a success! We always aim to be cheerful, knowledgeable and go out of our way to help our customers out and hopefully this is the experience that you continue to have of all of us at RNB.